Boo Boo Zoo First Aid Cool Packs are adorable, collectible zoo animals that provide comfort, convenience, and a smile for minor “boo boos.” A Boo Boo Zoo gives children a cool, soothing hug for their minor bumps and bruises. Boo Boo Zoo First Aid Cool Packs include a removable, flexible ice pack (made in the U.S.A.) that conforms to legs, arms or forehead to provide cool comfort. The soft, washable fleece zoo animal cover protects skin from direct contact with the frozen ice pack. Keep reusable ice pack in freezer for quick use when needed. Simply place frozen ice pack into Boo Boo Zoo pouch and place on child’s injury. 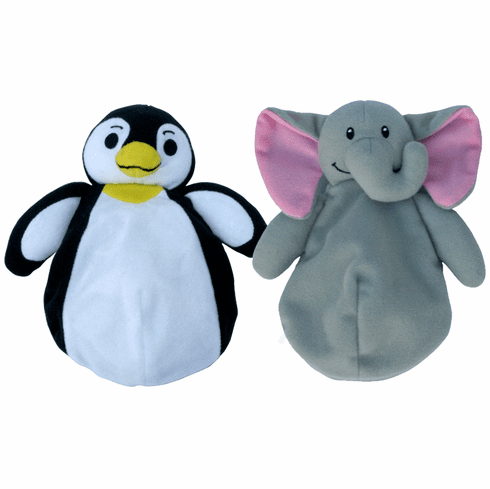 Choose from Boo Boo Zoo friends Ellie the Elephant or Freezie the Penguin! Includes a removable, flexible ice pack. Soft, washable fleece zoo animal cover protects skin from direct contact with the frozen ice pack. Comfort, convenience, and a smile for minor boo boos. Product Care: Ice Pack - Wash with cool water after every use. Avoid sharp objects which could puncture surface. Discard ice pack if surface is damaged or torn. Non-toxic. Cover - Remove ice pack. Hand wash with cold water and mild soap. Rinse thoroughly. Air dry.